I felt very sorry for Anne. I hated the way she was treated by her family. It infuriated me. I had to keep reminding myself that they were different times, but I don’t know if I could have held my tongue if I was Anne. We do get a glimpse of the rules of society and why Anne was discouraged from marrying Wentworth, but what was the consequence? Anne losing her “bloom” and seeming to be generally unhappy. Not good. Maybe it’s because I’m a big fan of Wuthering Heights and that twisted, pining love that I find this book and Anne and Capt. Wentworth incredibly romantic (I don’t like twisted romance in real life, mind you). I remember watching the more recent Masterpiece (I guess BBC) adaptation a few years back and thinking the same thing. It’s absolutely excruciating though…waiting around for them to finally recognize that they are only for each other. There is no end to my dislike for Anne’s sisters and her father; so incredibly shallow. But Jane always must have the comic relief of these annoying characters. It makes the story more fun. This was an enjoyable read, but I still much prefer Pride and Prejudice and Sense and Sensibility. That being said, I really like Anne Elliott. I appreciate her steadfast nature. Persuasion proves that sometimes good things do come to those who wait. I still can’t quite reconcile the fact that she is a sibling of Mary and Elizabeth. Elizabeth is just a first class B (which, ending up alone in the end, she gets her just desserts) and Mary is such an impetuous whiner. I love how she was happy for Anne in the end because she would be able to boast of Anne’s fortune to make herself look good, yet still wanted to prevent Wentworth from obtaining his Baronetcy so her status would remain higher. Talk about only being out for yourself! In all, Jane Austen’s work here was quite enjoyable, as always. Her observant take on people and their inner workings are often spot on and always comical. Looking forward to reading the rest of her novels. At twenty-seven, Anne Elliot is no longer young and has few romantic prospects. Eight years earlier, she had been persuaded by her friend Lady Russell to break off her engagement to Frederick Wentworth, a handsome naval captain with neither fortune nor rank. What happens when they encounter each other again is movingly told in Jane Austen’s last completed novel. Set in the fashionable societies of Lyme Regis and Bath, Persuasionis a brilliant satire of vanity and pretension, but, above all, it is a love story tinged with the heartache of missed opportunities. In her introduction, Gillian Beer discusses Austen’s portrayal of the double-edged nature of persuasion and the clash between old and new worlds. This edition also includes a new chronology and full textual notes. This is a read for The Classics Club. Overall I really liked this novel, although I agree that it's kind of painful watching Anne--who's an awesome character--be so sad and lonely through most of the novel. I liked Wentworth's letter at the end, but I really really wanted him to grovel more. A lot more. I really need to get around to reading Jane Austin. So much to read and so little time! I often have trouble reading about put upon passive characters, I myself want to jump into the novel and encourage them to stand up for themselves. This was not my favorite Austen read Michelle but like you I felt sorry for Anne. 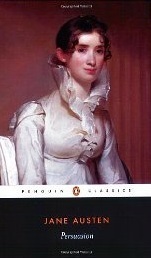 Out of the 2 Jane Austen's I've read, I preferred Persuasion to Pride & Prejudice. Crazy, I know but I related very much to Anne and found it very relevant to today. One of the books I still have to write up the review for. New GFC follower here from Bloggiesta. Great job on all you got done! Every little bit helps! I think I would have enjoyed this one more if Austen would have lived long enough to have polished it more. It had so many things I really liked and Wentworth's letter at the end was perfect!